This timeline includes not only transistor radios but also a number of crystal and subminiature tube radios that were relevant to the early years of transistor radio production, especially pocket-sized radios. Please consider this as an "approximate" and incomplete timeline: Many of the radios here have well-documented production dates, and some do not — I've done the best I can here with what information I've been able to find on the questionable dates, but please email me if you have something concrete to add — I regularly update this page as I come across new information. Any radio with a black-and-white thumbnail image below indicates that the radio isn't found on this site and it's on this page only to fill out this timeline. Likewise, not all the radios on this site are included in this timeline — only those which I consider to have some commercial or historical interest. For a complete photo-list of the radios that are on this site, please see Radios by Country. ITALY: 1951 Allocchio Bacchini "Junior 1"
4-tube subminiature tube radio — '54 or '55? first Standard shirt pocket — August '57? 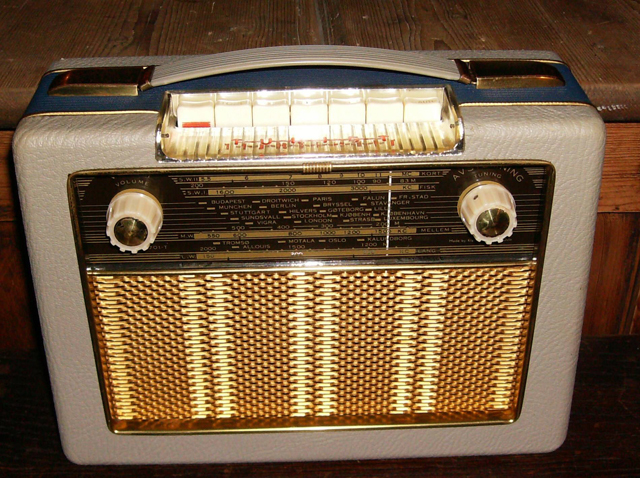 first Czechoslovak transistor radio � and first Eastern Europe all-transistor radio? � or was Hungary's Tunde the first Eastern Europe all-transistor radio?